One of the main activities in most nations is agriculture and its importance lies in providing food for the growing population. Ecuador has a great natural wealth, it is geographically located on the Equatorial line that gives it its name, which allows it to have a stable climate almost every month of the year with positive consequences for the agricultural sector. The implementation of information and communication technologies (ICTs) in agriculture tends to generate automation and efficiency in processes that were previously carried out manually. Not only does the use of machinery and equipment allow this advance. It is also incorporating computer systems of analysis and help in the decision on fields and crops that allow improving and facilitating productivity, improving land management and your planning. 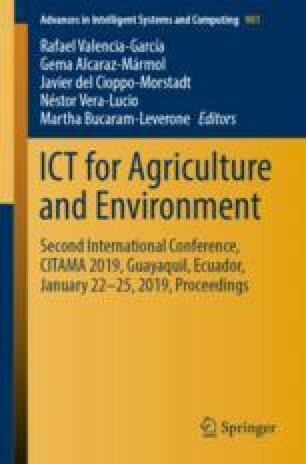 This article presents a decision support system based on expert knowledge of the domain for the control and monitoring of rice, coffee and cocoa crops, which based on information provided by the user and external information such as location and weather It will help in the process of crop selection, control, monitoring, diagnosis, pest prevention, fertilizer selection, among others. These recommendations will be made based on information modeled by experts and other factors in order to reduce costs, increase productivity and optimize the harvest time of the products. The proposed system has been evaluated for the diagnosis of crops affected by diseases, pests and weeds.